Accounting allows you to record your company’s assets. To access this function click on Company…Assets. The Assets menu displays. Before you create your Assets, it is recommended to create your Asset Categories and Locations first. You can also create them on the fly. To create your company’s assets, click on Company Menu…Assets…List of Assets. Click on the Add Asset button to create a new asset. To skip between the master files, click on the next or previous links. 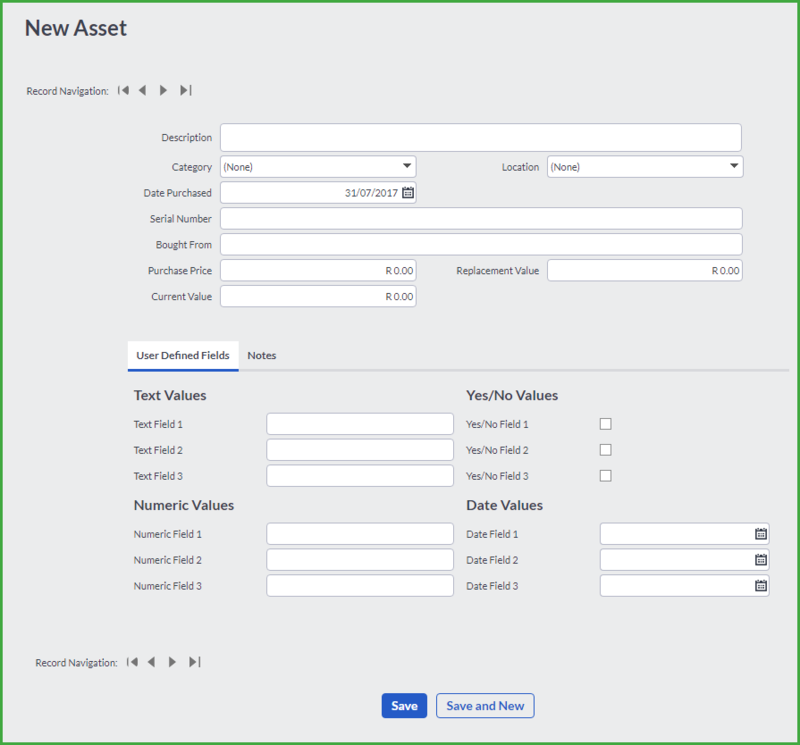 Enter a short description of the Asset in the Description field. Assign a Category and Location to the Asset using the drop down menus in the respective fields. It is very important to record the date you bought the Asset. Enter the Serial Number of the Asset, if applicable. Enter the Supplier’s details in the Bought From field. Enter the Purchase Price, Current Value and Replacement Value in the respective Fields. You can also add attachments by clicking the button. Individual files may not exceed 2 MB in size. A maximum of 5 attachments per note or transaction can be added. To create your Asset Categories, click on Company…Assets…Asset Categories. Click on the Add Category button. Enter a description of the Category in the Description field. Click on Save or Save and New buttons to save the newly added category and/or create another one. To create your Asset Locations, click on Company menu…Assets…Asset Location. Click on the Add Location button. Enter a description of the Location in the Description field. Click on Save or Save and New buttons to save the newly added location and/or create another one. Accounting allows you to import all the assets in your company. Reports are available both in the Reports menu and from the many Reports sections on screens in Accounting. You are able to drill down to the transactions by clicking on a line in the report if the reports are printed in detail. You can change the dates to preview the report for in the Date Range drop down menus. Click on the Refresh button to refresh the details on the report. Asset Register Report This report contains a list of all your company’s assets.